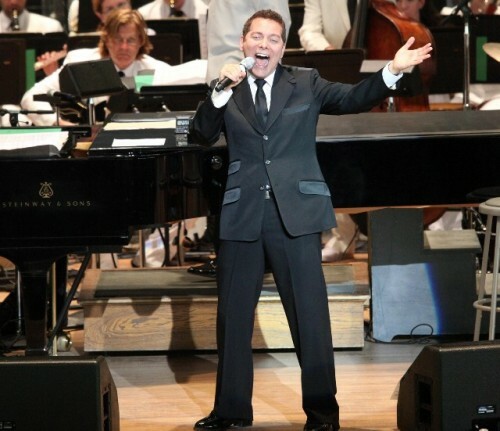 Michael Feinstein brought his Great American Songbook to Tanglewood. Hillary Scott BSO photos. Feinstein, Christine Ebersole and Betty Buckley. 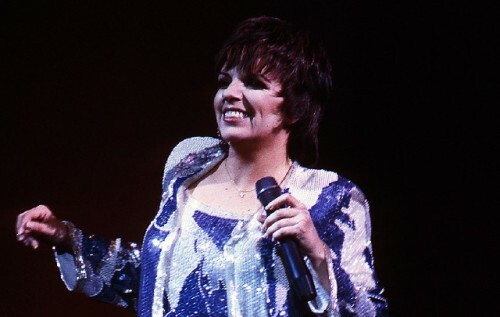 Liza Minnnelli made a surprise appearance. A duet of "New York New York." Remember her in Cabaret? Vintage Minnelli photos by Giuliano. Up close in black and white. For the final performance of the season, on a gorgeous afternoon, there was a surprise and magical Tanglewood moment. 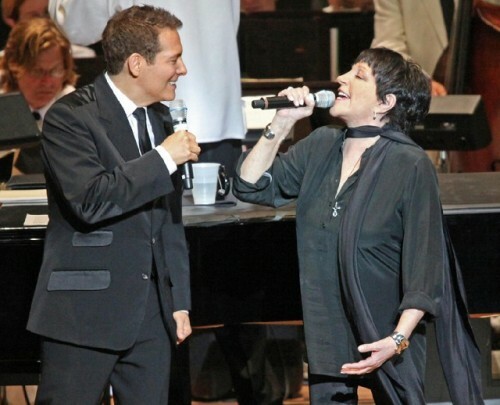 In a Pops program conducted by Thomas Wilkins singer Michael Feinstein enticed audience member Liza Minnelli to join him on stage. 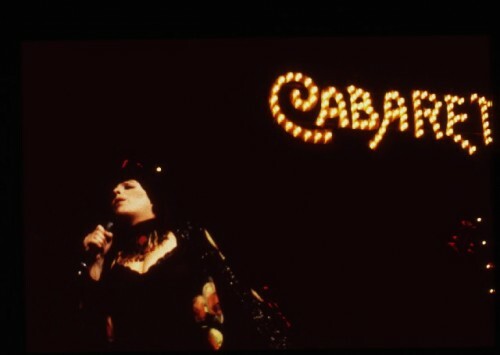 Now 65 it reminded me of many prior performances by Minnelli. We have posted vintage images evoking those memorable occasions. 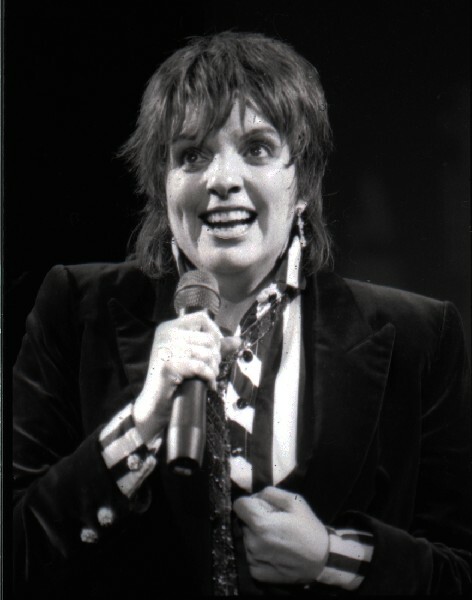 He was joined for cameo solos and duets with the renowned Tony winning performers Betty Buckley and Christine Ebersole. The program was a part of an experiment to end the Tangelwood season like how it has been starting for the past few seasons with a combination of rock and pops in The Shed. That meant scrapping the struggling but renowned Labor Day weekend Tanglewood Jazz Festival. It is difficult to argue with success. The rock group Train, which performed last year, returned on Friday for a near capacity, teenyboppers and chaperones audience. On Saturday, the rock group Evanescence was featured. Yesterday’s Pops concert sold about two thirds of the Shed with an equal if larger audience enjoying a hot, sunny, Sunday afternoon on the lawn. For shade there were clusters of folks set up around trees. The weather, often tricky and stormy over Labor Day, could not have been more delightful. It certainly enhanced the festive mood of the upbeat and enjoyable program. Feinstein proved to be a fabulous host for an expoloration of the incredible American Songbook. He flashed oodles of stage presence and charisma to match one of the great voices of his generation. 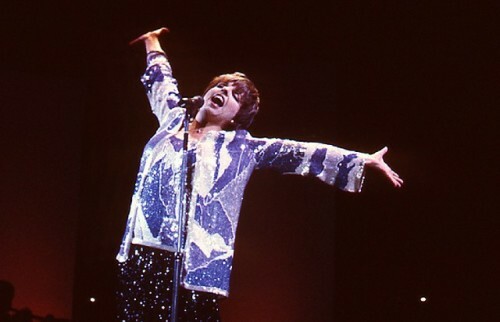 With his Vegas/ Broadway/ Big Band style Feinstein is a flashback to another era. He speaks worshipfully of “Nat King Cole and Mr. Sinatra.” One might add Bobby Darin, Tony Bennett, Wayne Newton, and Sammy Davis, Jr. But Feinstein is no chameleon or moldy fig. He has a compelling and refreshing style that is all his own. He can belt out a swing song and also croon with all those Pops strings adding depth and resonance. The change from Keith Lockhart to Thomas Wilkins as guest conductor cast a different and refreshing light on Pops. The approach of Wilkins was more understated but he seemed to evoke the best from the musicians under his command. He got them to swing like crazy but also extracted the lushness of many of the rich arrangements. This was his Tanglewood debut and it left me hungry for more. Wilkins opened with a medley based on Girl Crazy a 1930 musical by George and Ira Gershwin. It included orchestral arrangements of such standards as “I Got Rhythm” which opened and closed the segment with “Embraceable You” and “But Not for Me” in between. This was followed by a suite from Lerner and Lowe’s Gigi. The title tune “Gigi” and “The Night They Invented Champage” were particularly evocative. There was an odd introduction to Johnny Mercer’s “I Wanna Be Around” which he described as a “revenge song.” The composers difficulties with his wife apparently informed the dark but enticing mood and lyrics of the song. It seemed like an odd choice for a sunny afternoon in the Berkshires. It also evoked a very different orchestral mood from Wilkins who milked the score of its bathos. Betty Buckley romped through a medley from My Fair Lady. “I Could Have Danced All Night” was particularly tuneful. They performed a duet of “You Made Me Love You” with Buckley sticking to the refrain while Feinstein riffed snippets of other tunes like “Foggy Day in London Town” then they combined to take it out. Introducing “Somewhere” from West Side Story he spoke of the privilege of knowing Leonard Bernstein during his last years. He sat on a stool to sing a song which he described as a plea for love and peace. Closing the set he sang the Benny Goodman anthem “Sing, Sing, Sing.” It is more often performed as an instrumental big band arrangement. It was the high point of Goodman’s 1938 Carnegie Hall performance, the first by a jazz band. They tore the roof off of that occasion with the arrangement as a vehicle for an extended Gene Krupa drum solo. A couple of seasons ago Keith Lockhart led the Pops in an amazingly accurate replication of that classic during a Goodman tribute. So, until next year, ‘That’s all folks.’ It’s been awesome.